These five banks, are Malaysia's top five largest banks by assets. Fintech related competition, challenge or hackathon is nothing new in Southeast Asia; but, a challenge that attracted five large commercial banks into the same platform, is unseen before. Innov8tif is as excited with our participation in The Challenge, if not more, as the organizer and other participating institutions. creative usage of Innov8tif's eKYC components to support real-time ID capture in blazing fast speed with OkayID and automation of facial sighting process with OkayFace. As an industry player in the fintech solution provider space, Innov8tif aims to bring awareness on the new evolution in low-code and computer vision technologies, to the bright undergraduates who will soon join the workforce - and probably continue to contribute in fintech ecosystem too. Joget, Inc. R&D team has been working on - the best ever Joget Workflow major product upgrade, for about 2 years now. I am personally extremely excited with what Joget Workflow v6 has to offer. It is realising a true low-code RAD (rapid application development) platform. 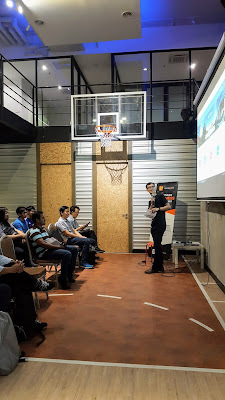 Today, Joget Lab Malaysia hosted a seminar in Klang Valley Malaysia for the preview of Joget Workflow v6 new features. Joget v6 will have a dual pronged focus: User Experience (UX), and App Maintainability & Performance. We are glad to have Mr. Hugo - the Joget's VP of Technical Consultancy, to walkthrough with us the above described new features in live demo. Nothing beats a live demo! Joining us earlier today, are the active enterprise customers of Joget Workflow in Malaysia, as well as network of Accredited Partners. BankTech Asia is a series of annual events where banking meets technology. 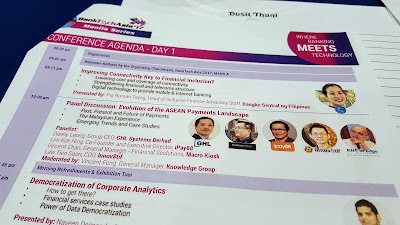 Last week, on 19th-20th Sep, BankTech Asia 2017 Manila Series was held in Philippines, and Innov8tif is honoured to be invited by MDEC as a speaker for panel discussion titled "Evolution of the ASEAN Payments Landscape". Mr. Tiensoon, our COO, represented Innov8tif for the panel discussion with other payment industry leaders - Mr. Danny Leong of GHL Systems, Mr. Lim of iPay88 and Mr. Vincent Chan of Macro Kiosk. This session was moderated by Mr. Vincent Fong from Knowledge Group. While every panelist agreed that smarpthone had and is playing a vital role in the evolution of payment technologies and trends, but the emerging trends are evolving so quickly that, almost no one can assure what exactly the future big waves would be. There are technologies that "came and gone off", quickly, due to lack of adoption, or untimely emergence. Nevertheless, artificial intelligence (AI) is a clear sign for what's foreseeable, and the world is certainly going to be more cashless than ever. Mr. Tiensoon made the following remarks about what AI has to offer for payment industry. Nowadays, I think nothing “new” you hear this year could escape from the word AI – artificial intelligence, which comprises keywords such as machine learning, deep neural network, robotic. Chatbot is a good example of AI-powered product that has reached a matured state in recent years. In eKYC, as the onboarding processes have to be as automated as possible, ideally, AI will definitely play a key role. 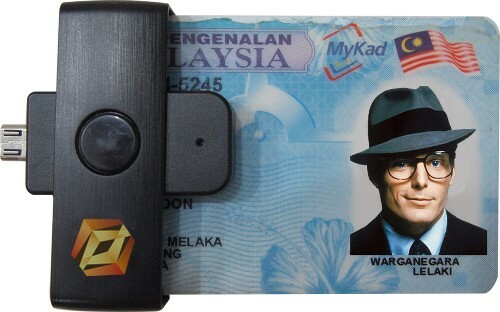 The mobile OCR (scanning with smartphone camera in layman description) of ID card that we have deployed to most of the telcos in Malaysia, is an example of computer vision technology. 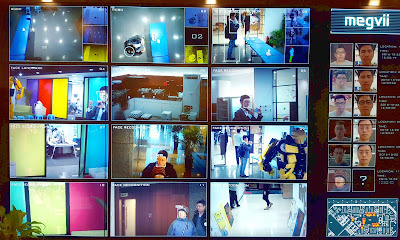 Another application of computer vision – is facial recognition, to automate the sighting process remotely without customer’s physical presence at branch. And, both ID card scanning and facial recognition technologies can get better, with machine learning. As the machine learns from more examples, it knows better at differentiating and recognizing the patterns and contents of a specific ID card. 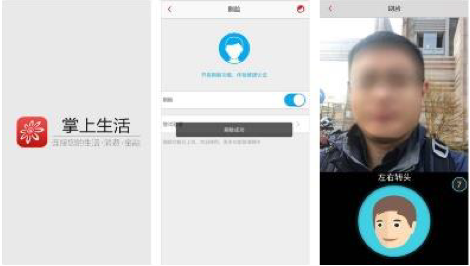 In China, facial recognition is applied in every imaginable use case in fintech. You have cash withdrawal ATM that performs facial recognition as the 2nd factor of authentication; you have Alipay that uses facial recognition as part of eKYC process; and now you have KFC Hangzhou that welcomes payment with a smile! In business, there shall be no permanent enemy. Or, in Chinese proverb - "one more friend is one less enemy". Alipay has become so huge, so successful and widely adopted in China, that it is now going global. It is not hard to spot the "Alipay" sign in major international airports popular among Chinese tourists, especially in duty-free shops and tax refund counter. Two panelists in this forum - GHL and iPay88, are good examples of how their businesses are benefitting from Alipay's global expansion into Southeast Asia. GHL has partnered Alipay to offer Malaysian in-store merchants and online merchants an alternative payment method, while iPay88 supports Alipay as an additional payment method through its gateway. CIMB - one of the top 10 ASEAN bank brands, welcome Alipay by acting as the settlement and merchant acquirer bank to facilitate Alipay payments in Malaysia. For fintech companies and mobile wallets to flourish in the remittance pie at large scale, customers onboarding must ultimately be self-service. Self-service customer onboarding is an area that garners the highest interest within the banking and fintech area this year. Which also means, the KYC process must be evolved into eKYC (electronic KYC). And the new paradigm shift, is posting a new set of challenges not just to the banks and fintech companies, but ultimately the regulators – Central Bank in this context. Using Malaysia as example. As the citizens are already equipped with national ID which has a chip containing thumbprint for verification purpose, the Central Bank requires that KYC is independently done by each bank or financial company providing money services. And as this method has been recognized for so many years, as the only reliable and trusted KYC method, it becomes a stumbling stone now in the digital customer self-onboarding age. The only way that a customer can complete the stringent KYC process, is to have his/her MyKad verified with fingerprint verification, which, requires presence of specialized hardware. And it is making it very challenging for any new fintech company to compete in the mobile wallet and remittance pie, when it comes to customer acquisition. Bank Negara Malaysia (Central Bank of Malaysia) is planning to regulate eKYC processes for remittance transactions, with the new standards to be finalised by October this year. In Singapore, the government is already rolling out a new digital ID service known as MyInfo. And it is already in the piloting stage with UOB, DBS, OCBC, and Standard Chartered Bank. Customers with a voluntary enrolment into MyInfo database, will be able to sign up a new bank account, 100% online, without needing to submit any additional supporting document. In Thailand, the Bank of Thailand is staying ahead in the eKYC game. A set of new regulations has already been released to facilitate eKYC. The guideline in Thailand requires “same standard” of face-to-face relationship in eKYC as the traditional KYC. And electronic method is permitted to conduct face-to-face interaction. Which means, a video call is all that’s required! Banks and fintech companies can expand market reach without investing into heavy capex as seen in traditional branch expansion model. In Philippines, the proof-of-ID comprises too many types of possible documents. Fortunately, the House Committee on Population has recently approved the bill pushing for national ID system. It would be interesting to see, if Philippines would be the first country in ASEAN to have a nationwide national ID system that allows online validation. Out of ASEAN, China and India are the 2 countries that already have the most eKYC-friendly national ID system in place. For this reason, the fintech sector is booming more rapidly than one would expect. Payment industry has always been a key and interesting industry to watch in the financial sector. As it involves the flow of money, it is highly regulated by very stringent guidelines and regulations around the world. Yet, this is a fast-evolving and highly competitive industry that requires creative use and adoption of technologies, while at the same time staying within the compliance parameters and regulator's radar. 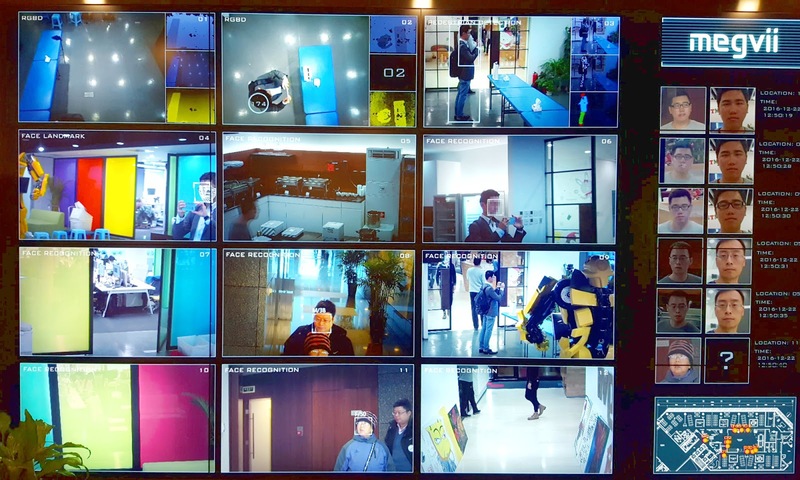 Facial recognition technology, a high-tech scene in sci-fi movies years and decades ago, has now reached a state of maturity for real-life business use cases. 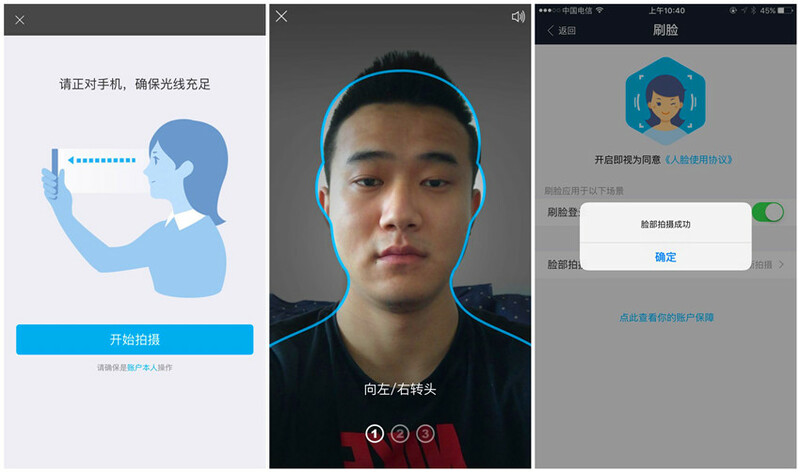 We have previously blogged about how facial recognition technology is applied in banking and financial use cases in China. 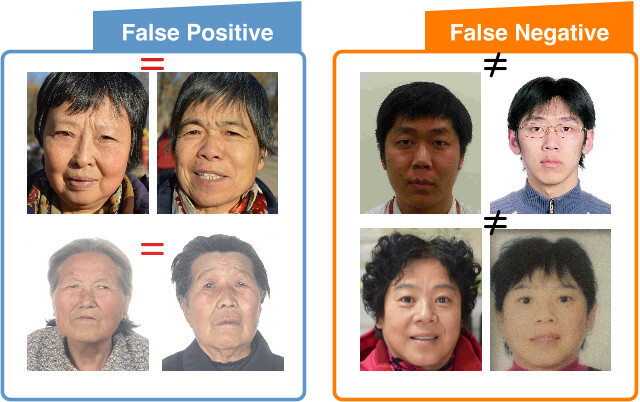 How likely it is to determine a face belonging to the same person as shown in a photo, as negative result. Technically, this is also termed as false negative. How likely it is to determine a face that is not belonging to the person shown in a photo, as positive result! Technically, this is also termed as false positive. This can also be an issue of "spoofing attack". False negative is largely harmless to business risk. User/customer can simply reattempt the facial comparison again, and s/he may succeed in the next try. False negative could also be contributed by ageing of subjects and complex possibilities of lighting conditions. But false positive (erroneously indicates a given condition has been met when it is not) is the subject that concerns business risk and compliance. When a person can be granted access to one's monetary asset simply through positive match of facial comparison against ID photo, this process itself is already presenting major loopholes even if human sighting is practiced instead of facial recognition technology. Never the less, facial recognition technology in real-life business use cases is expected to be intelligent enough to identify spoofing attacks, and counter masquerade. Following are the 3 major types of spoofing attack you should take into consideration, while evaluating facial recognition technology for facial ID verification use case. The use of facial photographs of a valid user to spoof face recognition is the most common attack method. In fact, this is also the easiest and least complicated spoofing technique among all. When I was using the Face Unlock feature in my HTC One X in year 2012, my phone could easily be unlocked with a photo of mine. Facial recognition API is to match 2 facial images, and determine the likelihood of these 2 images representing the same person. Thus, if you are just invoking a facial comparison API (e.g. Amazon Rekognition, Microsoft Face API) to fulfill facial ID verification, your solution is definitely vulnerable to the least sophisticated spoofing attack. Counter Attack: Liveness check must be incorporated into the client that captures live face photo. The user of selfie camera must proof that he/she is indeed, a live person. The least sophisticated liveness check - is eye blink. But a blink isn't enough. Photo editing software can easily create high resolution and high quality animated image that simulates eye blink. Sophisticated live face detection should support a series of liveness check, including head movement. Examples: movement of landmark features such as opening of mouth and turning of head from left to right, and nodding. Screen replay spoofing can be done through recorded video played on a smartphone or any screen panel. Counter Attack: Liveness check at the client side isn't sufficient to counter this attack. However, realising the fact that screen replay involves the capturing of image from device camera to another display screen, the face comparison API can be incorporated with sophisticated neural network and deep learning to identify every little difference that could be presented by the display screen. We are referring to the spoofing attempt with high quality mask. One that you can relate to in CSI. Counter Attack: Similar to countering screen play spoofing, deep learning and neural networks are required in facial comparison to identify patterns and features of a mask, and isolate them from passing through liveness check. Deep neural network is a key area in machine learning, for complex problems that can't be represented by linear relationships. Cognitive algorithm with machine learning capability will "learn" continuously, from experience. It can get to a stage where it becomes continently better than human - consistency is the key and main differentiator. The FaceID product from our technology partner - Megvii Technology Inc, is reportedly isolating hundreds of suspicious transactions for a mobile payment platform. And the blacklist database has accumulated experiences beyond the 3 major spoofing techniques described above. "Once you stop learning, you start dying" - Albert Einstein. This quote is now applicable to machines too. MyKad, or sometime mis-spelled as "my card", is the Malaysian identity card issued to citizens aged 12 and above. The permanent residents, Malaysian Arm Forces personnel and Malaysian Police personnel are also issued identity card of similar features, known respectively as MyPR, MyTentera and MyPolis. A software specially programmed to support MyKad reading on an identified operating system - such as Windows, Android, iOS. Reliable and accurate data retrieval, as long as the chip, reader and software are working correctly. Less susceptible to fraud. It's easy to print a fraudulent card that looks similar to the genuine copy, but it is technically more challenging to produce a fraudulent smart card. Quick. It only take a few seconds to retrieve personal identification details from a MyKad. You can retrieve more demographic data than those printed on the card, such as religion, place of birth. A hardware reader is required. This may introduce further considerations such as hardware wear-and-tear. When a chip is worn-out or broken, it will not be readable. This method is technically known as OCR (optical character recognition). You can read up more about how OCR works, from our previous post. In a nutshell, OCR involves an image processing process, to recognise and extract printed text from a photo/image of the card surface. Can be very portable. If you are using mobile device camera as the input for OCR, you can complete the whole scanning operation within a mobile device (e.g. Android, iOS) without requiring another hardware. Click here to find out a commercially available technology that supports MyKad OCR on mobile. Supports pre-filling. By scanning the details printed on card surface, you can save the data entry time by a few minutes. User only needs to check the pre-filled details and make necessary correction, instead of 100% data entry. Do not expect it to be always-accurate. OCR is to support pre-filling of a form, not to be expected as the ultimate data for submission. Some noises such as lighting reflection, can affect accuracy of the recognition process. No authenticity check. With technology today, it is entirely possible for a fraudulent card to be printed at the same, or very similar quality to the genuine card. OCR scanning is not able to differentiate between a genuine or a fraudulent card. Method 3: Read with Human Eyes! No additional technology cost to be invested. Human eyes are good at recognising and differentiating watermarks. Susceptible to human data entry errors. Many times slower than machine (e.g. chip reading and OCR scanning). FMCG (fast moving consumer goods) sector is probably the next industry after banking and financial, which can benefit tremendously from optimised sales processes using modern mobile technologies. Following are some examples of optimisation which are ultimately driving cost saving and increased revenues. Process a fulfilment 2 working days sooner than before. 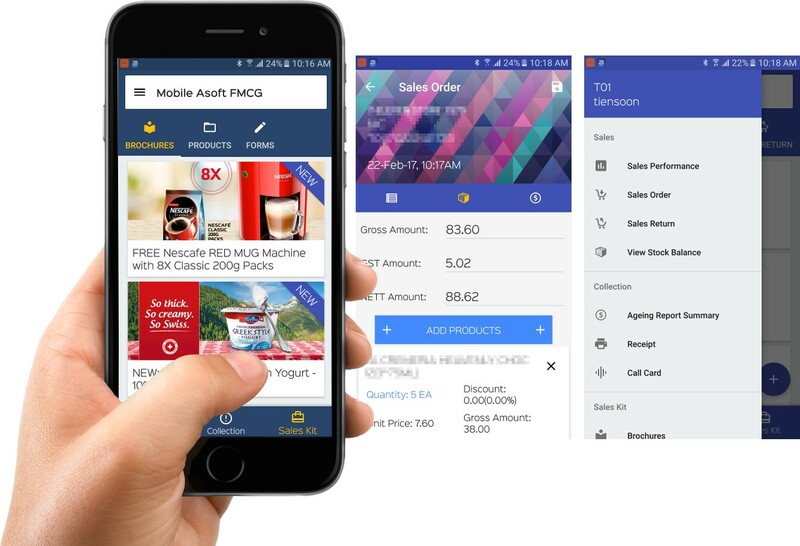 In late 2015, we have inked a partnership with Asoft Digital - a software company that developed IP (Intellectual Property) in ERP (Enterprise Resource Planning) system and commands a customer base among the Malaysia's FMCG distributors, to verticalise EMAS (Enterprise Mobility Application Software) as mobile SFA for Asoft's clients. With a mature platform base, it didn't take us long to complete the first version of this partnership product, named as Asoft SFA. Sales summary: Presenting to salesmen a quick overview of sales performance they have achieved, for the month and for the year so that they can keep track against their sales forecast. Sales order: Allowing salesmen to submit their orders to HQ directly from mobile app in the most natural way that most salesmen are trained and accustomed to. Sales return: Allows returns to be keyed in in a similar manner with sales order. Ageing report: Ageing retrieved from the backend system is presented directly on the SFA app to allow salesmen to view an updated version of their customer’s ageing. Eliminates the need for paper ageing report as per with traditional practices. Stock report: Allows salesmen to get a feel of what are the inventory levels back in the warehouse, without the need to make that telephone call to an office clerk. Customer receipt: Payment collection receipts can be printed via a paired portable Bluetooth printer and synchronised into ERP backend. Rome is not built overnight, and not every journey is constantly rosy. Following are some lessons we have learnt through this strategic partnership that is working out very well. Domain knowledge is always important: Never under-estimate the importance of domain knowledge, no matter how similar a use case is to another industry. At a quick glimpse, how much difference could a FMCG sales ordering form be, from a consumer e-commerce catalog? Well, a thought process that is applicable to consumer's usage pattern, is not entirely applicable to a B2B process. The partnership with Asoft is continuously a reliable source of domain expertise, as they are dealing with the actual users. 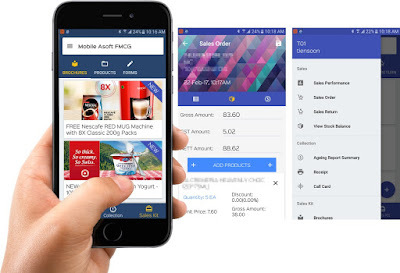 Handling of offline mode: The user experience of offline mode that we have designed for financial institution and telecommunication company, is also not entirely applicable to FMCG sales ordering. In the use case of customer acquisition for financial/credit products, a relatively high degree of realtime-ness is expected. But for FMCG sales ordering, batch processing is proven to be more practical. Sales ordering form: A FMCG salesman is accustomed to traditional paper-based order form that helps "get the job done" quickly - especially to a person who is using the same form, repetitively, day in and day out. Often, if little thought is put into the design of an electronic form, user will find him/herself spending more time than the traditional method, and it creates resistance in change. The only way to mitigate change management challenge, is to convince and proof to the the users that, the mobile form is not only helping the company, but the users too. Fraud management: What's stopping a user from printing a payment collection receipt multiple times, with varying amount in the copy issued to customer, and the copy generated for the Company? Interesting, and a real-world issue that we have mitigated. A business partnership is only, and will only be sustainable, when it is a win-win partnership for the long term. Facial Recognition Use Cases in Banking & Financial Industry - How are the Chinese Leading in AI Tech Adoption? When speaking about AI (artificial intelligence) and deep learning technologies, the Chinese are not just innovating at rocket speed, but the businesses are rapidly adopting these technologies in real-life business use cases to optimise customer experience and expanding market reach. 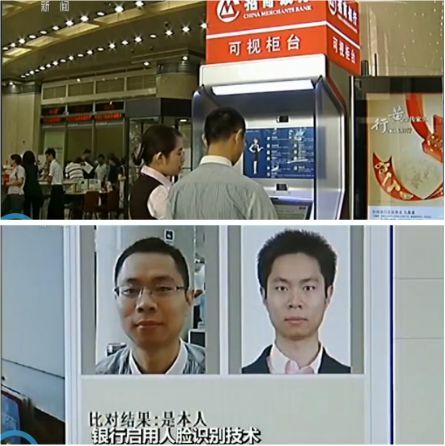 Let's have a look at how the Chinese banking and financial industries are using facial recognition in business operations governed by stringent security requirements. When a customer has already completed the know-your-customer (KYC) process, the bank would already have the customer's ID photo (either extracted from the ID card, or a facial photo captured during KYC). As the customer repeatedly progresses his banking and financing needs with a bank or financial institutions, why can't the customer apply for a new product or service, from the comfort of his/her couch at home/office? Alipay (an asset of Alibaba's Ant Financial and world's largest mobile payment platform since 2014 Q2), China Merchants Bank (as of 2015, it ranks third of all Chinese companies for net cash), China CITIC Bank (China's seventh-largest lender in terms of total assets), Bank of Jiangsu and Ping An Bank are using facial recognition API to accomplish remote ID verification, either through the convenience of a mobile app, or a self-service kiosk/ATM/VTM. Some of these case studies are cited to have only 0.001 error rate at 98% True Positive Rate. If you assigned a human to perform 10,000 verifications in a day, how many mistakes do you think a human would have done? The Alipay app has a feature that enables users to enrol his/her facial photo as biometric login. Instead of keying in the password, the app recognises the user's face, and logs the user into his/her account upon successful verification. In use cases where an even more stringent security requirement is to be met, facial recognition can serve as part of the 2FA (Two Factor Authentication) process. Imagine ATM machines fitted with camera that performs facial ID verification, in addition to the ATM card PIN number. Why not? China Merchants Bank is using facial recognition to realise card-less withdrawal at ATM machine. 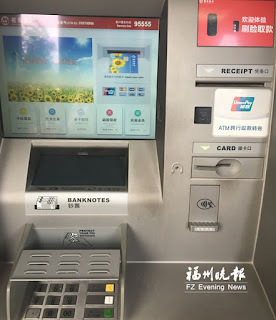 Instead of relying on ATM card and PIN, customers can also perform cash withdrawal through a combination of facial verification plus one-time-pin delivered to mobile phone. Another use case that has been widely implemented, is to rely on machine to determine the "yes" or "no" of customer's facial sighting process, over-the-counter, aided by banking staff. This process has been around in airport immigration check-points for some time. Instead of trusting on human to make the decision of facial verification, robot is entrusted instead - not susceptible to mood, fraud, and careless mistake. 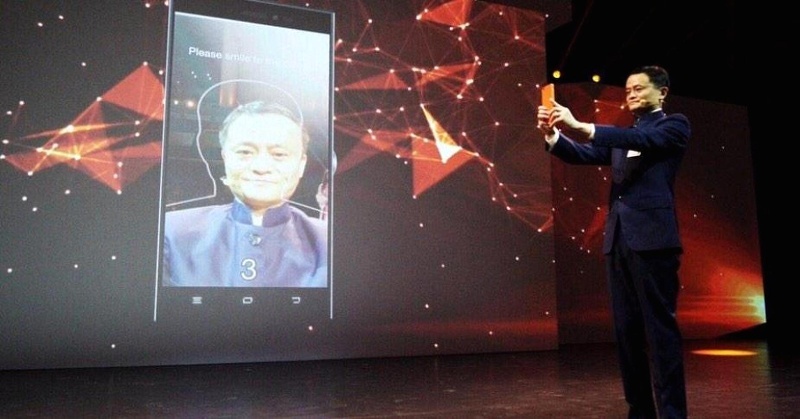 At CeBIT 2015, Alibaba's Jack Ma demonstrated "smile to pay"! The app validates mobile payments by matching a photo taken by the user at the point of purchase to a stored profile photo. How Does Automated Facial Recognition System Prevent Attacks? The next time when you see someone looking at his smartphone and moving his head, opening his mouth, he may not be Snapchatting; he could be performing a banking transaction or applying a financing facility! In the sign-up, enrolment or on-boarding process of any product or service, the one aspect that is definitely required is ID (identity document) information. Examples of ID are national ID card, passport, visa, and driver's license. Some ID cards contain a chip, while some have machine readable code printed onto the card, and some are simply a card printed with readable characters. In general, following are 3 methods to read/scan a ID card as part of digital customer experience. It's easy to identify if an ID card is a smart card. 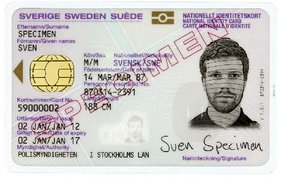 It has a visible chip, such as the Swedish national ID card shown below. Other countries and regions adopting contact chip for ID card are EEA (European Economic Area), Malaysia (MyKad), Thailand, Hong Kong, UAE, Mongolia, and Pakistan (SNIC). Reading of contact smart card/chip requires a smart card reader connected to the operating system platform of your choice - e.g. Windows, Android, iOS. The smart card reader, on its own, is not able to decipher information stored in any ID chip. You will need a software programmed to support the specific ID chip reading, in order to correctly retrieve the required data from a smart card-enabled ID. Typically, what's going on within the ID chip reader software is a set of APDU command messages. Every ID may store data in a different structure. The chip will usually contain a lot more information than what's printed on the physical card surface. Besides additional biography details, an ID chip will also contain the ID bearer's photo, and even biometrics data such as fingerprint minutiae. Same concept as applied to contact chip, but the contactless smart card doesn't have a gold-plated chip visible on the card surface. Instead, the smart card contains embedded IC connectable through radio waves. Visa payWave and MasterCard PayPass are the 2 common examples of contactless smart card. As of ID card, the Second-generation Resident Identity Card in People's Republic of China contains a contactless smart card. Indonesia's e-KTP is another example. try tapping the card to the back of your smartphone. If your smartphone beeps, it indicates that a contactless chip is detected. 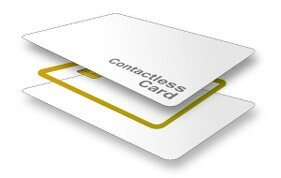 To read a contactless smart card, a contactless reader (sometimes also referred to as NFC reader) will be required, along with a software that supports deciphering of the specific ID card chip data. Image capturing of an ID, either through the traditional flatbed scanner, or a camera photo. Computerised processing of the ID image file, to extract any machine readable data or printed text into machine-encoded text that can be understood by human, e.g. ID number, full name, address. Following are some factors that determine the feasibility and accuracy rate of ID card OCR. Quality of the input image. The best and most consistent quality, is undeniably the scanned image from flatbed scanner. However, it is less portable, and hardly a convenient complement for today's mobile-oriented channel. Smartphone camera photos are not created equal. It is susceptible to motion blur and lighting reflection. Presence of MRZ (machine readable zone). Data encoded and printed into MRZ format is optimised for OCR, and thus, ensures a very high OCR accuracy. Most passports worldwide have MRZ printed on the identity page. Presence of 2D barcode. California's driver's license has a 2D barcode printed on the back of the card, which contains the bearer's identification details. When the barcode is properly decoded, the scanning result is almost always-accurate. Quality of printed text, or the font type used. If there is a rubber stamp or signature on top of printed text, it will deteriorate OCR accuracy. Not all font types are created equal. Some font types - such as OCR_A and OCR_B are specifically optimised for OCR, and thus, speeds-up the OCR speed and accuracy. Some font types do not present vast distinction between O and 0, I and 1, and will impact the accuracy rate. Font size matters too - text with larger font size is easier to be recognised at higher accuracy rate. Consistency of the content layout. It's obvious that, the more consistent a card layout is, the better it is for OCR. Some IDs created in the pre-digital computerisation era are not printed with 100% consistent layout. Presence of marker. In some cases, the word "Address:" always precedes street address. This serves as a consistent marker for OCR engine to recognise and interpret street address. Language. English content comprises Latin/Roman alphabets, and it's one of the easier finite set of alphabets or symbols to be recognised by OCR. Chinese characters on the other hand, are far more complex. The traditional processing method in OCR technology. If server-side OCR is applied to ID input from mobile channel, it is done at the expense of user experience. Each time a photo is captured and submitted from mobile channel to server-side OCR engine, the user has to wait for upload to be completed. Once server-side responded with OCR result, and if the result isn't satisfying, the image capture and upload process has to be reiterated again. If OCR is fully rendered in client-side, such as within the iOS/Android platform, user experience is more seamless. While smart card reading promises retrieval of always-accurate data, OCR may not - especially when the OCR scanning is relying on recognition of printed text instead of MRZ/2D barcode, and when scanning is performed from today's modern channel - i.e. mobile device camera. Besides, it is also easier to forge an ID card on the printed surface, than the smart card or chip. Smart card may contain security features, and even PKI. However, when speed of data entry and minimising human errors are the primary objectives, OCR is definitely a very good option when smart card reading isn't possible. At the same time, you may experience failure in reading a smart card, if there is manufacturing defect or the chip is simply damaged over time due to negligence.